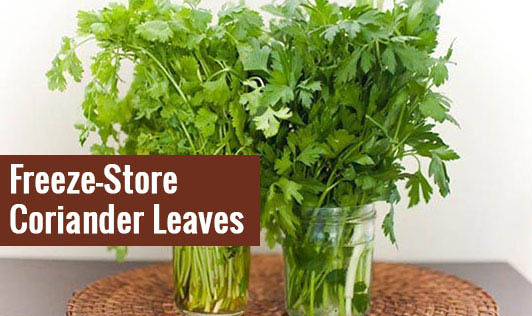 Most of us try to find ways and means to make our coriander leaves last long in the refrigerator. I came across this interesting kitchen tip on the internet. Clean, wash thoroughly and finely chop the coriander leaves. Take an empty ice tray and fill each space (cube) with chopped leaves. Top each cube with some water and freeze the trays. These frozen cubes of coriander leaves can be dropped directly into a curry or gravy during cooking. Otherwise, the leaves can be used raw after thawing the cube and draining the water.